I once heard someone say, “If healthcare were treated like any other service industry, it would be out of business within a week.” As a clinician, I couldn’t help but agree with this statement. Appointment times can be difficult to get, the pre-visit paperwork is often redundant, waiting room time is often long, and the environment is often sterile and ‘clinical’ in look and feel. And, after you are all done (and hopefully recovered), you are rewarded with a bill that is almost always confusing to understand. Also, a 2017 study by Deloitte determined that “hospitals with higher patient-reported experience ratings have better process-of-care quality scores and better scores for some, but not all, clinical outcomes.” This finding was corroborated by Judith Hibbard and Jessica Greene in their research study entitled, “What the Evidence Shows about Patient Activation.” They found ample evidence to connect activated patients – patients who exhibit a willingness and ability to take independent actions to manage their health and care – with good patient experiences, and noted that patients who reported higher quality interpersonal exchanges with physicians had higher patient activation scores. And, once a patient was satisfied and then ‘activated,’ patients were found to have better health outcomes at a lower total cost of care. The interdependent and positive relationship between outcomes, lower costs and patient experience means that achieving good outcomes is often predicated by positive patient experiences. So, how can you foster better patient experiences? First, health systems can improve the facility design and use of technology to create a warm and comfortable setting conducive for interpersonal communication. Second, leaders should focus on care team alignment in workflows that are coordinated around the needs of the patient. Finally, a good experience shouldn’t stop when the patient leaves the facility. Providers need to follow up to ensure patients are properly informed and feel they have received the care they needed. 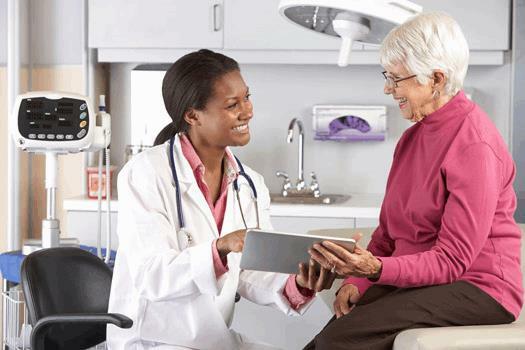 Digital tools, physical space and interpersonal communication can all be essential components to ensuring patients feel connected to their care. The healthcare facility: Perception often plays a big role in medicine. When I first started practicing medicine more than 20 years ago, I was still driving my old car from residency. I had a longtime patient of my new practice tell me, “Doc, I think I like you as a doctor, but I don’t want to be taken care of by a guy who drives a beater car like that. Do yourself a favor and buy a new car.” While I know he said “do yourself a favor,” I interpreted it more as “do the patient a favor… give him the perception of being associated with a successful health professional.” Within a week I had a new car, and I always walked into my clinic wearing a blazer and tie. Clearly, there is value in providing patients a perception of success with well-appointed equipment. We hear similar sentiments from Midmark customers across the country. For one community health center in California, their new facility made a big impact on customer perceptions. One patient shared that the new facility and equipment like automated vitals acquisition and height-adjustable exam chairs were “very fancy,” and the perception of the care they receive is now higher. Even though they had always received good care from the practice, the new design and new technologies front and center in the exam rooms enhanced their perception of the overall experience. Having the optimal equipment in a well-designed workflow can have a significant impact on patient experience. Not surprisingly, the 2017 Deloitte study found that “clinical quality measures that are more visible and tangible for patients, such as emergency department wait times and readmissions, are more strongly associated with patient experience ratings.” While the visible is top of mind, there’s little doubt that patients also notice behind the scenes elements – at least when they’re not working correctly. Staff frustrated by connectivity issues or malfunctioning software most certainly impact patient perceptions of the overall care experience. In a profession often surrounded by fear and anxiety, the look and feel of the facility – and its equipment and technology – matter. The healthcare team: Patients know when teams work well together – and when they don’t. Repeated questions, forgotten or neglected tasks, and arguments or pettiness between staff make patients uncomfortable. A team working in harmony, though, can quickly put the minds of patients and loved ones at ease. Often, it is technology that helps align the care team around the needs of a patient. Clinical dashboards and standardized care help to minimize repeated questions or neglected tasks. For example, automated vital signs acquisition where the data is directly ported to an electronic medical record (EMR) helps to reduce both errors in manual data entry and variability in manual readings. Teams using reliable, automated equipment can save time and ensure accuracy – rather than wondering if the caregiver taking a BP really measured 171/76 or 117/76 on a non-hypertensive patient and perhaps having to measure the BP again to make sure the reading is correct. Access to reliable information at the point of care allows the healthcare team to make the best decisions regarding a patient’s health. But, technology is not the only factor; face-to-face time for providers and patients matters, too. The 2017 Deloitte study details a collaborative care approach used by Wisconsin-based ThedaCare. They use a bedside-care team for each patient, including the case physician, nurses, pharmacist and a dedicated discharge planner – and have seen patient experience measures improved by 50 percent. Similarly, respondents in an NEJM Catalyst study said, “care teams are the most effective method of engaging patients, with a combined 91 percent calling them extremely effective, very effective, or effective.” So, both digital tools and interpersonal elements are necessary for successful healthcare teams. The care and follow-up: The patient ultimately wants the best care she or he can receive – and the delivery of care in a hospital or clinic can make a difference in how well instructions are followed at home. The Hibbard and Greene research study shows that patients who have good experiences are more likely to follow instructions, be better prepared to follow-up with caregivers at the right time should problems develop, and wisely use expensive resources (like emergency rooms). Just as happy employees are the most invested and give employers their best work, happy patients are the most engaged and help gain better outcomes at lower costs. It’s worth the time it takes to follow-up with patients and gather their feedback to ensure they have what they need to be activated, engaged participants in their healthcare. New technologies and tools designed to engage patients in their follow-up care are beginning to translate into positive experiences. While these tools are primarily designed to be effective in advancing disease management objectives, knowing your care team is available at the click of a button is also reassuring. Rapid intervention on complex conditions can avoid adverse outcomes and thus minimize situations where health situations become more serious – which may lead to a bad experience. In many ways, I think the healthcare industry is beginning to realize it is a service business. The recent change in reimbursement that directly rewards good experiences is simply priming the pump toward expanded efforts to give patients the best care journey possible. As clinical teams increasingly realize that good outcomes and lower cost are predicated by positive care experiences, I am confident the attention given to the facility, the dynamics of the team, and the after-visit outreach will be areas of focus for all healthcare systems. For additional resources on improving the patient experience, including white papers and case studies, click here.